Outdated mailing lists waste your marketing dollars. Over 3.5 million Americans move each month. It’s why everyone’s mailing lists are outdated in mere weeks -unless they’re updated. It’s also why the US Postal Service says a third of all bulk mail ends up in the garbage. Don’t let your prospects and customers slip through the cracks like this. Data hygiene keeps your mailing list formatted correctly while removing duplicates and out-of-use addresses. This means your marketing pieces reach actual people – and your marketing budget goes much further. 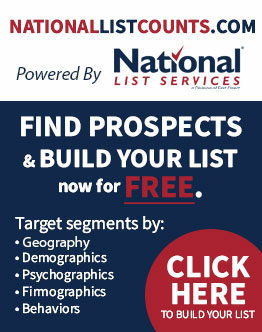 Let National List Services match your mailing list against the last 48 months of US Postal NCOALink® (including LACS® and SuiteLink) data. Our Delivery Sequence File Processing (DSF2®) verifies your list against another 165 million+ US Postal data points. Enhance your address hygiene even further with our Deceased Suppression, PCOA and DMA Mail Preference services. With top-notch address correction, postal and carrier route presorting is a breeze. All of this means your marketing mail reaches people for the lowest postage rate possible. Our GeoCode processing system uses precise rooftop coordinates to help you better understand your market’s geographic data, such as flood zones and electoral boundaries – so you can better plan your media coverage and target modeling. We’re here to direct you through any part of this – can we help you get started?